Although Bell’s Crave streaming service likely should have launched with the ability to stream content in 1080p when it first relaunched, until now the platform was locked to 720p with the only exception being Apple’s 4th-generation Apple TV. 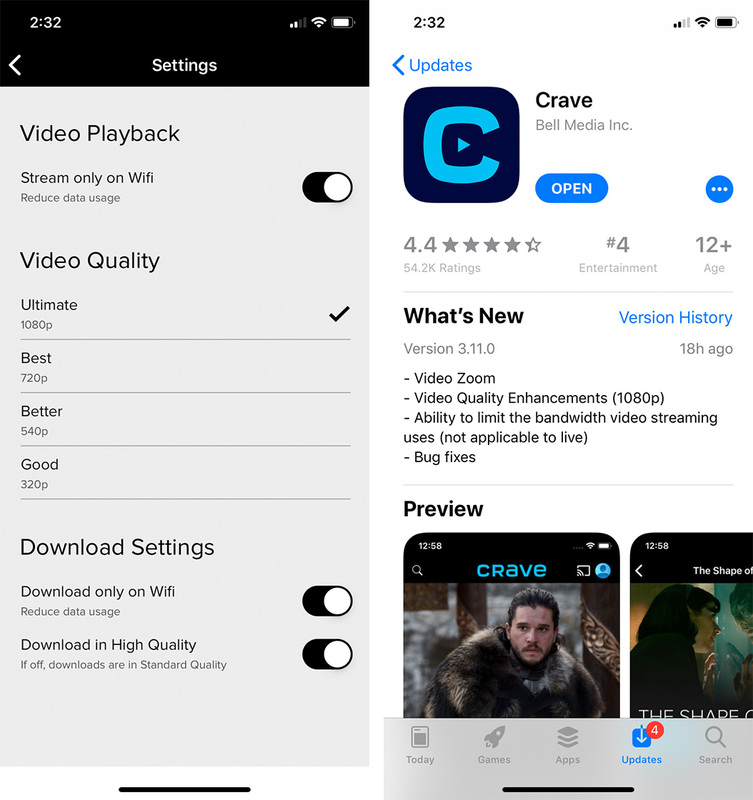 Now, a new update to Bell’s mobile Crave app allows subscribers to stream content in 1080p on the iPhone, iPad, Android and Xbox Onedevices. Previously the maximum resolution you were able to stream to these platforms was 720p. Further, Crave now allows users to limit the bandwidth the platform through new settings. The first option is ‘Good,’ which locks all content to 320p, with the next being ‘Better’ or 540p. The final two options are ‘Best,’ which is 720p and the aptly named ‘Ultimate,’ or 1080p. The timing of this latest update to Crave makes a lot of sense given the final season of Game of Thrones is set to launch on April 14th. While CraveTV first launched back in 2016, Bell recently relaunched the streaming platform as Crave in November 2018. Along with a redesigned user-interface, this revamped version of the streaming service includes current HBO content for an additional $9.99 CAD per month. The base level of Crave starts at $9.99. The platform also offers a new Starz subscription for an additional $5.99 a month. Crave is available on iOS, Android, Xbox One and Apple TV. What’s a little confusing about this update is why it took Bell so long to start streaming content in 1080p on more platforms given that 4K is now the standard across competing services like Netflix and Amazon Prime Video. Update 03/04/2019: This story has been updated with information regarding the Xbox One version of Crave being able to stream in 1080p.